Designer Maria Carluccio loves playing with transparency and the bleeding of colours in watercolour painting. This came into play while she was designing her new collection, Sweet Treats. 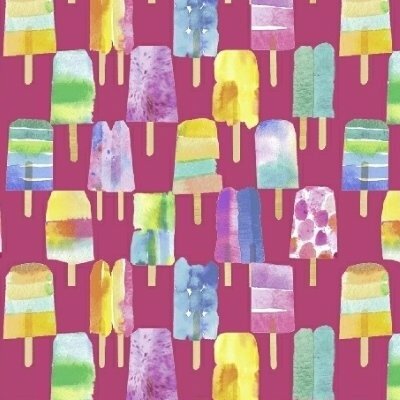 Her watercolour adventures seemed to lend itself organically to a sugary sweet ice pop pattern from which she continued to develop the theme for this line. This collection is ideal for bags, makeup cases, head scarfs, beach gear and children's apparel. Please note the price is for 1 Fat Quarter of sweet treats fabric. For 1/2 Metre of fabric, add 2 units to your shopping bag. For 1 Metre of fabric add 4 units etc.